Local Worcestershire based creative communications agency drp, brought home five awards at the annual EVCOM Industry Awards on 30th November. Taking place at Tobacco Dock, London, the awards showcased 33 categories for the very best in video, live events, and internal and external communications within the creative industry. Recognised in 14 different categories drp took home three gold awards, one for ‘Best Promotional Film’ with Gett UK, GROSVENORFILM ‘Brand Communications’ for their work with Forces4Incluion, and thirdly, ‘Digital Communications’ for drp’s work with Direct Line. 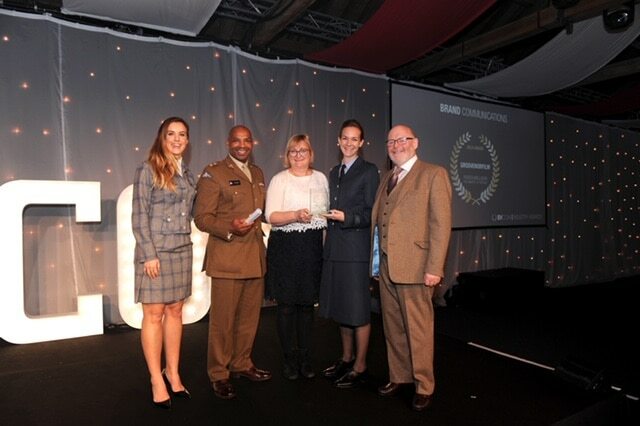 This was followed by one sliver win for GROSVENORFILM in the ‘Excellence in CSR’ for High Speed 1 (HS1) category, and a bronze win for ‘Best Educational or Training Event’ for their work with the Army Engagement Group. drp took home gold for the #DrivenByQuality campaign with app-based global taxi company, Gett Taxis, as they required a campaign to help promote the quality of their drivers and services, which was centred around a series of individual films, telling the personal stories of Gett drivers, immersing the audience in their lives. For Direct Line, ‘Claim Not Your Fault’ campaign, drp created a solution that would help communicate the campaign message to its internal audience, in a bespoke way, which was created via a branded app and gamification. GROSVENORFILM took home gold for their work with Forces4Inclusion as they specially commissioned films, as part of a Tri-Service Ministry of Defence initiative. As well as The Army Engagement Group campaign and the ‘Quench Your Thirst’ campaign for HS1. “It’s fantastic to be recognised by 3rd parties, in different awards for the work that we do on behalf of our clients. Over the last few years, we have specialised in producing programmes that make a difference in CSR, as well as to organisations who embrace diversity and inclusion”. As well as taking home awards at the EVCOM Industry Awards, On Thursday 29th November at the Natural History Museum, GROSVENORFILM also won the top Diversity Team of the Year Award at the European Diversity Awards.